Coconut flour pancakes are slightly sweet, fluffy, and loaded with lots of health benefits. Coconut flour itself is low in carbohydrates, gluten-free, and can be a great substitute for regular flour. It contains more protein and fiber than wheat flour. It also has a great texture and a slightly sweet, coconut flavor. We topped these pancakes with fresh berries and a little maple syrup, but you could also top them with powdered sugar, butter, or any fruit you like. These pancakes are super easy to make. They mix together quickly and don't require any extra effort than regular pancakes. You don't need very much coconut flour since the fiber in the coconut fluffs up when combined with wet ingredients! So you can make quite a few pancakes from a bag of coconut flour. Whisk together the greek yogurt, eggs, and vanilla extract in a medium-sized bowl. Whisk in the cooled melted butter until smooth. Whisk in the coconut flour until there are no lumps. Allow the batter to sit for five minutes so the coconut flour can absorb the liquid from the batter. It will puff up a bit too while it sits. Heat the griddle on high heat. Add butter or coconut oil to the griddle to grease it. Turn down the heat down to medium low. Add the batter to the griddle in the shape and size you wish. Cook for a few minutes or until they stop bubbling. Flip the pancakes and cook a few minutes on the other side. 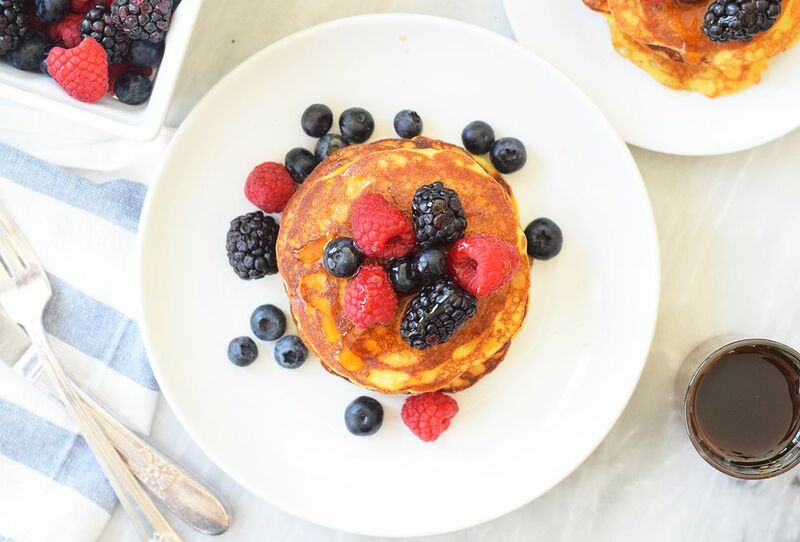 Make a stack and serve with berries and maple syrup! Dig in and enjoy! There are many substitutions that you can make in these pancakes. Try coconut oil or other light-flavored oils in place of the melted butter. You can use sour cream instead of the plain yogurt, or vanilla yogurt, (but this will add a little extra sugar). Make sure you turn your griddle or skillet to low heat while these pancakes are cooking. They can burn easily and you want to make sure they don't get too brown before they are cooked through. Make sure to allow the coconut flour to absorb the liquid from the batter for a few minutes before you add it to the griddle or it will make the batter gritty. Cool the melted butter slightly before adding it to the egg mixture or else the hot butter will scramble the eggs.